About 30 Texas exes were introduced during a halftime ceremony. Joyner Holmes scored 17 points and Sug Sutton hit four free throws in the final 8 seconds to lift No. 11 Texas to a 73-67 victory over TCU Saturday at the Erwin Center. Texas improved to 15-3, 5-1 in the Big 12. TCU is 12-5, 2-4. TCU, which trailed by 14 points in the second half, cut UT’s lead to 65-63 with 2:12 to play. 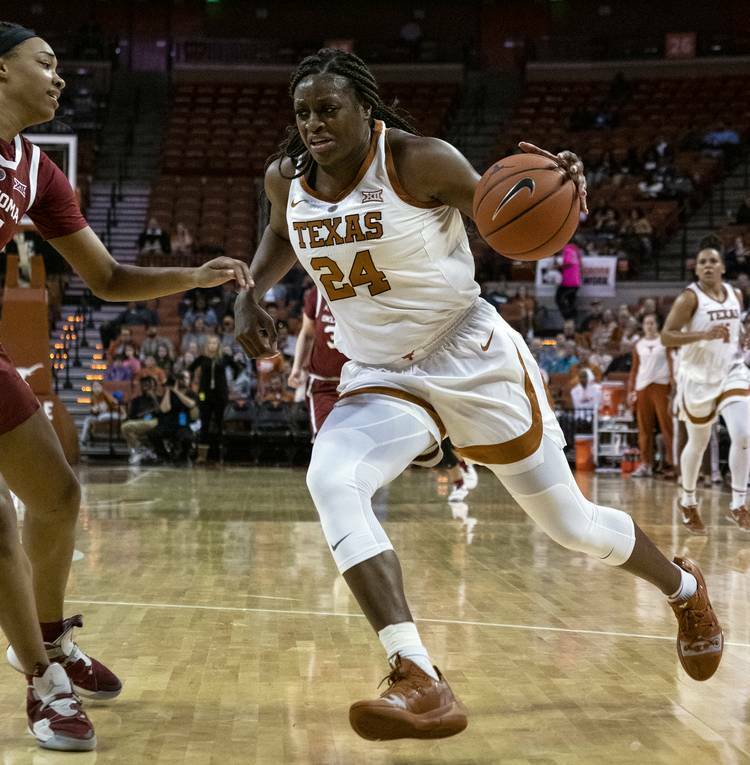 Texas used a 12-2 scoring spurt in the last six minutes of the second quarter to take a 33-26 lead at halftime. The Horns opened the third quarter with a 7-0 run. Freshman Charli Collier had one of the better halves of her young career, scoring 9 points to go along with 3 rebounds in the half. Texas improved its series record over TCU to 42-3. NICE AWARD: Before the game Sutton was awarded the Judy Dunn Award during a ceremony at midcourt. The honors goes to a player who aspires to teach, coach and make a difference in the lives of young people. UP NEXT: Texas returns to Big 12 action with a home game at 7 p.m. Wednesday against Kansas. It will be shown on the Longhorn Network. News on Bevo Beat is free and unlimited. Access to the rest of Hookem.com is included with an Austin American-Statesman subscription in addition to Statesman.com and the ePaper edition. Subscribe today at statesman.com/subscribe.